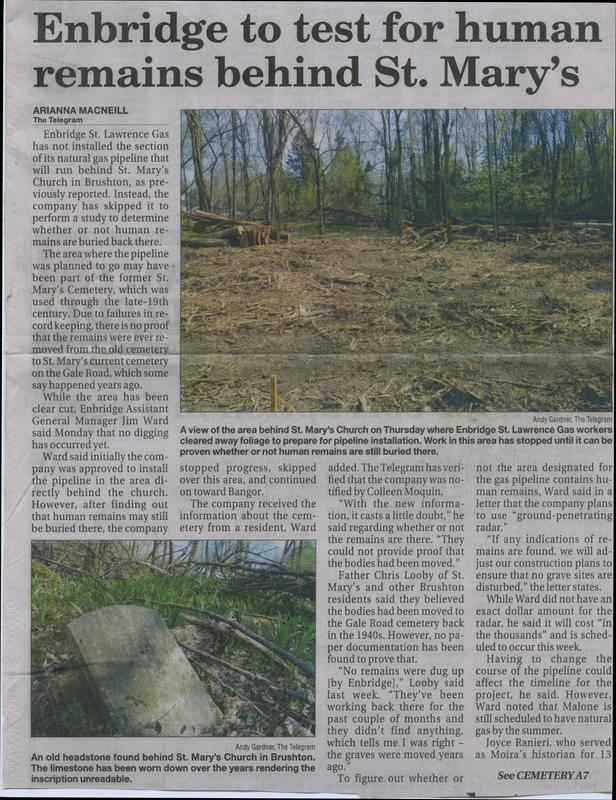 DIRECTIONS: Remnants of this old cemetery are located in the woods behind St. Marys Catholic Church, on the north side of Route 11 in Brushton Village. St. Mary's Catholic Church at Brushton was a part of the Malone parish until 1850, when it became an independent charge. In 1855 the first church building was erected. The original St. Mary's cemetery was located right behind the church. The earliest remaining stone dates to 1855. In 1892, the church purchased land on the Gale Road for the purpose of a new cemetery and began burials there. Sometime around the 1940's, a decision was made to use this area for a parking lot. The stones appear to have been bulldozed backwards, into the woods. For years I heard rumors that there were piles of stones located in the brush. Some are complete while others have been reduced to mere rubble. I believe that there are probably at least another dozen stones that could be uncovered and/or reconstructed given the proper equipment and time. The first version of this list was compiled 9 August 1995 by Joyce M. Ranieri. On 27 April 2002, I returned to the area to take photographs of the stones. At this time, I discovered stones I had not found before. My husband (Michael) and two sons (Joseph & Andrew) spent a great deal of time walking through the area, looking for tiny corners of stones, and then removing brush and sod to determine whether or not they were field stones or tombstones. Click here to see a "Picture from the Past ", printed in the Malone Telegram, Monday 29 March 1993. Click here to see a map of the church property. Click here to see general photographs of the area where the stones were found. Click here to read about the Thompson children, who were buried in this cemetery. This piece of stone has no information on it whatsoever. ... 4 yrs. ... & 25 d's. In Memory of Mary Died Apr. 1, 1855 AE 2 yrs. & 7 mos. Aug. 18, ... AE 10 m's. 18 d's. Loisa A. Dau. of Wm. & Susan Barnett Died Mar. 29, 1878 AE 14 y'rs. 5 m's. & 16 D's. And sleeping in her lonely grave. Jeremiah BENNAN Died Apr. 29, 1882 Aged 84 y'rs. May his soul rest in peace. Amen. This face of the stone has no inscription. It appears that there once was a different "top" to the stone where the statue of Mary now sits. John G. BURNS Died July 9, 1877 AE 32 Y'rs. But we hope to meet him there. Simon BURNS Died July 29, 1887 AE 52 Y'rs. Nancy CAMP Died Aug. 9, 1886 AE 53 Yrs. Gone but not forgotten. Margret daughter of Moris & Ellen CAROLL, died Aug. 3, 1856, in her 14 y'r. Robert COX Died May 5, [1875 or 1873] AE 24 y'rs. Lucy Wife of Frank Deuyour died Nov. 1, 1878 AE 50 y'rs. Mary Ann daughter of Michael & Mary FITZGAILS died Mar. 22, 1861 ag'd 10 mo. William Son of Michael & Mary FITZGARLS, died Jan. ... 1859, AE 1 yr. & 6 mos. He loved me best and called me home. Thomas FLANAGAN Died Aug. 16, 1878 AE 70 yrs. Catharine His Wife Died May 15, 1881 AE 72 yrs. Margaret LACLAIR Died Dec. 16, 1889 AE 63 Y'rs. May her soul rest in peace. Amen. James MURRAY Died Aug. 4, 1872 AE  Y'rs. Martha MURRAY His Wife Died May 26, 1867 AE 56 Y'rs. Peter MURPHY Died Oct. 6, 1887 AE 83 Yrs. Native of Co. [Carlow] Ire. John Son of Eugene & Mary OCONNOR Died April 15, 1859 AE 2 y's. 11 mo's. Johney, Son of James & Catherine Ryan, Died Feb. 20, 1881 Aged 6 yrs. 7 mo's. But oh, how sad the father's heart. He's left a lonely mourner here. Thomas SMITH Died Apr. 26, 1872 AE 23 Y'rs. Bennie Son of B. & M. E. VILLNAVE Died July 17, 1880 Aged 2 Y'rs. 6 M's. Helen Dau. of Joseph & Hortense [VORGEL or VAEGEL] Died Nov. 20, 1883 AE 5 days. "E . . EN, WIFE OF . . . WARD WALSH, DIED. . . "